Updated Sunday February 15, 2015 by Paul Peterson. Swim meets are a great family experience. They're a place where the whole family can spend time together. Listed below are some guidelines geared to help you through your first couple of swim meets. It may seem a little overwhelming, if you have any questions, please ask a coach. Arrive at the pool at least 15 minutes before the scheduled warm-up time begins. Therefore, for Wednesday meets arrive at 3:45pm and Saturday meets 7:45. Find a place to put your swimmer's blankets, swim bags and/or sleeping bags. The team usually sits in one place together. Make sure your swimmer checks in with his or her coach! Once "checked in", write or have the swimmers write each event-number on his or her hand in ink. This helps him/her remember what events he/she is swimming and what event number to listen or watch for. This will be posted on the fence at most pools. Your swimmer now gets his/her cap and goggles and reports to the pool and/or coach for warm-up instructions. It is very important for all swimmers to warm-up with the team. A swimmer's body is just like a car on a cold day-he/she needs to get the engine going and warmed-up before he/she can go all out. After warm-up, your swimmer will go back to the area where his/her team is sitting and wait there until his first event is called. This is a good time to make sure he/she goes to the bathroom if necessary, gets a drink, or just gets settled in. The meet will usually start about 5-10 minutes after warm-ups are over. It is important for every swimmer to know what event numbers he/she is swimming (again, why they should have the numbers on their hand). He/she may swim right away after warm-up or they may have to wait awhile. A swimmer's event number will be called, and he/she will be asked to report to the “bullpen”. Swimmers should report with his/her cap and goggle. Generally, girls events are even-numbered and boys events are odd numbered. 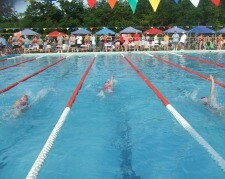 The “bullpen” will usually line up all the swimmers and take them to the starting blocks in the correct order. You can expect at least 4-8 heats of each event. The swimmer swims his or her race. He/she is to ask the timers (people behind the blocks at each lane) his/her time. The swimmer should then go immediately to his or her coach. The coach will discuss the swim with each swimmer. Tell him how great he did! The coaching staff will be sure to discuss stroke technique with him. You need to tell him how proud you are and what a great job he did. Take him back to the team area and relax. This is another good time to check out the bathrooms, get a drink or something light to eat. The swimmer now waits until his next event is called and starts the procedure again. When a swimmer has completed all of her events she and her parents get to go home. Make sure, however, you, as a parent, check with the coach before leaving to make sure your swimmer is not included on a relay. It is not fair to other swimmers who may have stayed to swim on a relay where your swimmer is expected & should to be and s/he is not there. Results are usually posted the next day on the team bulletin board. Awards are gathered for the team and given to the coach at the end of the meet. The coach will give the awards to the swimmers at the next practice. External links are provided for reference purposes. Red Hook Recreational Park Pool is not responsible for the content of external Internet sites. Copyright Red Hook Recreational Park Pool All rights Reserved.